Follow Nurse-Healer Blog via Email! Enter your email address to follow Nurse-Healer Blog and receive notifications of new posts by email. 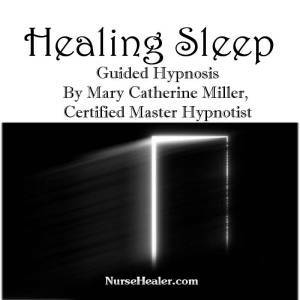 Healing Sleep Guided Hypnosis is a guided meditation recording by Master Hypnotist Mary Catherine Miller available through NurseHealer.com. This is a newly remastered recording with a soft, peaceful music background. Healing Sleep is designed to promote relaxation and healing sleep. Enjoy the tranquil relaxation and positive suggestions for health and well-being while relaxing, meditating or drifting off to peaceful healing sleep. Download the FREE mp3 HERE. Visit NurseHealer Store for hypnosis and meditation CDs available through Amazon. Never listen to meditation, hypnosis or relaxation recordings while driving or when you have the need to stay alert.